Based on correlation of two currency pairs (two or more currency pairs can be specified in the settings). Trades two pairs simultaneously (pair trading). Correctly works only with the major currency pairs (having USD). Open prices only (the EA explicitly controls bar opening). Pairs - set the pairs to trade. LotIncrease - algorithm for increasing the lot. HistoryBars - the number of bars in history for the EA to analyze to determine the entry point. Limit - the higher the value, the smaller the number of trades and the smaller the probability of a large drawdown. 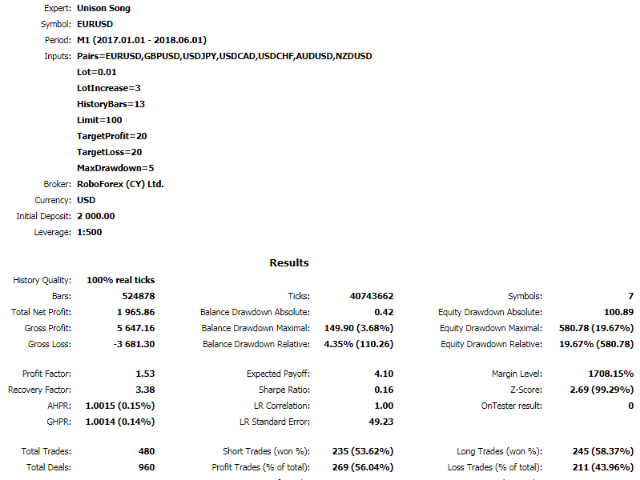 TargetProfit - target profit to close positions. TargetLoss - loss to open positions with an increased lot. MaxDrawdown - if the drawdown (margin*100/balance) is greater than MaxDrawdown, the EA will not open positions with the initial lot. 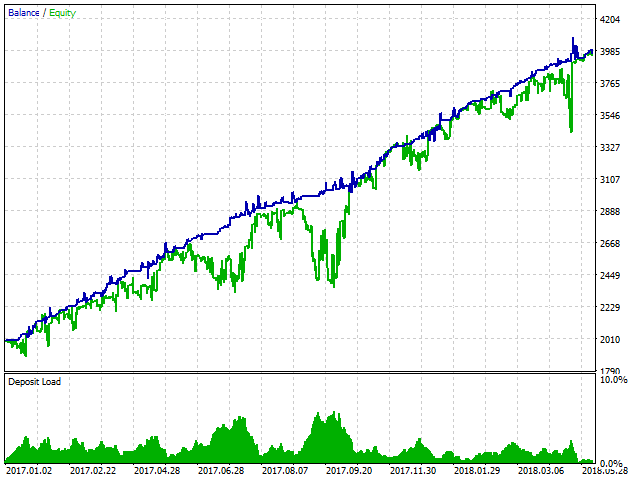 Example for setting the Pairs parameter: EURUSD, GBPUSD, USDJPY, USDCAD, USDCHF, AUDUSD, NZDUSD. All positions are closed if the total profit of all positions is equal to TargetProfit (decreases in proportion to the number of open positions). If the loss of the first positions (with the initial lot) is greater than TargetLoss, new positions are opened with an increased lot. TargetLoss is increased in proportion to the number of open positions. Testing was performed in "Every tick based on real ticks" mode.